Every so often the press get hold of a political hobby horse and absolutely refuse to let it to go. I'd declined to comment on it before but it seems the prospect of a Conservative/Liberal Democrat merger is something we're not going to hear the end of any time shortly. The battle lines drawn by Tim Montgomerie between 'Mainstream Conservatism' and 'Liberal Conservatism' seem to have taken root and barely a week passes without yet more merger speculation in the press and words of encouragement or condemnation from politicians. As always with predictions there's a risk involved in falling on either side of the fence but I honestly don't think it's going to happen. 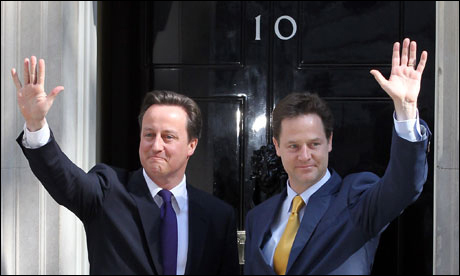 The Cabinet itself, and particularly Clegg and Cameron, seems to be composed of MPs sufficiently on the respective left and right wings of their parties to work well together but the fact remains that an overwhelmingly large chunk of each party detests the other. That's not to say there isn't an almighty shitstorm coming in 2015 - it just won't be as simple as a merger. From the Peelite split from the Conservatives in 1846 (and their eventual absorption into the Liberals in 1859) to the near-complete disintegration of party loyalties into pro- and anti-coalition camps of 1931 (which, incidentally, gave the Conservatives a whopping 473 seats and a 324-seat majority), British politics has seen its fair share of political shake-ups. Indeed, it was the most recent of these which gave birth to the Liberal Democrats in the first place. The 1988 merger between the Liberal party and the Social Democratic party (SDP) - which had itself split from Labour in 1981 - was one borne of electoral necessity rather than any great fealty. The conflict between these two groups has never really gone away and could well destroy the party yet. Indeed this duality is precisely why, since their inception, the Liberal Democrats have never really seemed to stand for anything. And this impression will be magnified exponentially in 2015 by the likelihood that those supporting the Government will vote Conservative and those opposing it voting Labour. There's a good chance this polarisation will be the end of the Liberal Democrats as a party but it would be overly simplistic to assume that its members will move in the same way as voters, i.e. Liberals to the Conservatives and Social Democrats to Labour. Granted, the latter is likely. After all the Social Democrats only left Labour because of its lurch to the far left under Foot and Blair essentially refashioned Labour into the SDP anyway. A Liberal absorption into the Conservatives, however, would not be so simple. While there are strong overlaps in attitudes towards market principles, small government and civil liberties, there are many dividing lines, not least of which is Europe. The Conservative party did a very good job of tearing itself apart over the EU on its own in the '90s and that was with a europhile minority. A massive intake of pro-EU Liberals would make the party completely ungovernable and, were a merger to happen, the new party would just as quickly split again. A classic economic liberal, Mr Clegg admits there is an intellectual attraction in carving for the party a crisper, purely liberal identity, much like that of the FDP - big on free market economics, the environment, internationalism and civil liberties. But he rejects this approach as far too narrow. More's the pity because this could be the one thing that saves his party and gives it something it has never had - a solid distinctiveness from the other two parties. He'd even have a head-start with the in-party think tank Liberal Vision. In Germany, for example, the FDP are far more market-orientated and socially libertarian than the very 'small-c' and socially conservative Christian Democrats. And, if coalition politics are a thing of the future in the UK, it is worthwhile pointing out that the FDP have been in government more than any other German party since 1949, despite consistently coming third in elections. This has further encouraged an ideological distinctiveness in the party which, given that it frequently holds the balance of power, can be very influential.